The pharmaceutical sector for Latin America has experienced significant growth over the past decade, with a sales compound annual growth rate of 7.5% between 2010 and 2016, according to the Economist Intelligence Unit. This growth is mainly due to an increase in life expectancy, population growth, increasing standards of medical care, the development of new products and treatments and the adoption of massive government campaigns for prevention and preventive care. The pharmaceutical sector comprises research and development, manufacturing, production, marketing and sale of chemical and/or therapeutic products for the treatment and prevention of diseases, and is estimated to have reached US$1.2 trillion in sales globally in 2016 according to IMS Health Incorporated, of which 30% were generated in the so-called “pharmerging markets,” developing countries where use of pharmaceuticals is growing most rapidly, as these are defined by IMS Health Incorporated. Latin America is one of the regions where the average age of the population is increasing most rapidly: more than 20% of the population is expected to be over 65 years of age by 2050, according to the United Nations Department of Economic and Social Affairs on 2015. Healthcare expenditure in Latin America has been historically lower than that in developed countries; however, the region already spends a higher share of GDP on healthcare than Asia, according to the Economist Intelligence Unit. As the economy develops and life expectancy increases, expenditures on more expensive drugs for the treatment of complex diseases, such as cancer and degenerative diseases, are expected to increase, while expenditures in drugs for the treatment of diseases like diarrhea, tuberculosis and others tend to decline. The pharmaceutical industry can be split among different product segments, according to Anvisa and IMS Health Incorporated, some of which are listed below. Generic drugs: consist of drugs for which the patent has already expired (usually after a 20-year period); any pharmaceutical company is able to start producing the drug and promote market competition. According to IMS Health Incorporated’s analysis of a 2011 industry survey, specialty drugs are drugs that (1) treat complex, chronic and/or life-threatening conditions and (2) have a high cost per unit. In addition, they may (3) require special storage, handling or administration and (4) involve a significant degree of patient education, monitoring and management. When compared to traditional pharmaceutical companies, specialty pharmaceutical companies tend to hold more pricing power, and therefore enjoy larger margins, due to the nature of their drugs. This pricing power has allowed total expenditures for specialty drugs to increase over the past ten years, as compared to traditional drugs (for both branded and generic products). The pharmaceutical industry has traditionally been characterized by extensive research and development. However, according to the U.S. Food and Drug Administration (FDA), the federal agency responsible for public health, from 1998 to 2010, research and development productivity (as measured by the number of new molecular entities approved by the FDA per billion dollars invested) declined by 40%. This decline suggests that the vertically integrated business model, in which large pharmaceutical companies control all steps of the value chain from product discovery to worldwide distribution and sales, generating lower returns on invested capital, is not sustainable. Following the decline of the vertically-integrated pharmaceutical business model, firms have moved towards an open-science decentralized approach, in which start-ups, biotechnology venture capital companies, university research centers and other players have engaged in partnerships with pharmaceutical companies to share the risks and rewards of developing new drugs. As a consequence, the source of new molecular entities has shifted from global pharmaceutical companies to smaller ones. Compared to traditional pharmaceutical companies, open-science companies tend to spend a lower percentage of their revenues on research and development through partnerships, enabling them to focus on other key aspects of their value chain. Despite specialty pharmaceutical companies having reduced in-house research and development expenditures, from 2010 to 2014 venture capital investments in biotech start-ups increased by more than 60%. For specialty pharmaceuticals within the retail business, the main decision-maker is the physician, who prescribes products based on a variety of factors, including the relationship and trust in the medical representative, scientific information and the strength of the brand. Unlike the sale of traditional pharmaceutical drugs, the sale of specialty pharmaceuticals usually requires a specialized sales force with trained and experienced professionals who focus on a limited number of therapeutic classes, as they must be able to conduct high-level discussions with doctors and representatives. The sale of drugs in different countries requires a deep understanding of the local regulations, which may vary materially. To overcome this lack of knowledge and achieve greater penetration across global markets, international pharmaceutical companies typically choose partners in strategic regions to leverage their regulatory teams, as well as their sales and distribution channels. 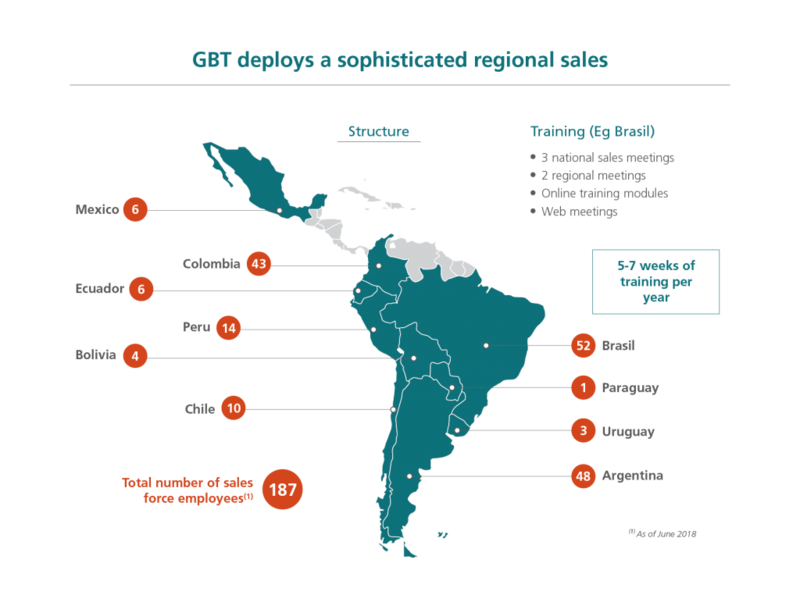 The Latin American market is well positioned to benefit from this trend.